Another problem has popped up with the Fall Creators Update, with affected upgraders finding that some of their apps are disappearing from menus in Windows 10. Those hit with the issue have found that the icons to launch some apps have gone missing from the Start menu, and neither are they to be found on the operating system’s list of installed apps. A Cortana search won’t locate them, either – even though the pieces of software in question are still installed on the PC. You can verify the latter because the Microsoft Store (formerly Windows Store) will indeed confirm they are installed, and you can launch the apps from here. This appears to be affecting the core OS apps such as Movies & TV, Groove Music, and the likes of Calculator, and indeed in some reported cases, the store app itself has disappeared which could certainly be problematic (in terms of attempting to launch that one from the Microsoft Store). Microsoft says that it’s investigating the issue, so hopefully a fix will be forthcoming, but for the moment, one of Microsoft’s Answers forum moderators has offered some suggested workarounds. These include repairing the missing apps, or reinstalling them, or failing that, reverting back to the previous version of Windows (i.e. rolling back to before the installation of the Fall Creators Update – not really an ideal solution). The former easier solutions (repairing or reinstalling apps) don’t seem to have worked for everyone on that particular forum post, although some folks have at least recovered some of their apps using those methods. They’re certainly worth a try. However, as mentioned, with any luck, Microsoft will get a proper fix implemented pronto. 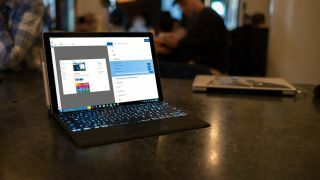 If you’ve run into any problems with the Fall Creators Update, be sure to check out our comprehensive guide on how to fix common issues you might stumble across.